In 1921, the Irish rebel leader Michael Collins was ordered to travel to London – with Arthur Griffith and the Irish delegation – to negotiate the Anglo-Irish Treaty which followed the Truce and the War of Independence. Collins loathed the assignment and protested vehemently: but the Irish political leader Eamon de Valera insisted that he must go. In London, Collins was regarded, at this time, in Winston Churchill’s own words, as “a legend among the gunmen and revolutionaries who held Ireland in thrall… [whose] prestige and influence amongst all extremists was high.” Churchill was Colonial Secretary in charge of Ireland, and the two men were prepared to detest one another across the green baize table. Churchill was deeply opposed to Irish “rebellion”: Collins certainly did not trust Winston, who had been part of a British government which had sent the notorious “Black and Tans” to Ireland. Yet, at a point when the Treaty talks seemed to be in stasis, Churchill and Collins spent the whole night drinking together, talking, arguing, even singing and reciting poetry to one another. They emerged from this session, according to Lord Birkenhead “fascinated” by each another: and according to another witness, as “bosom friends”. Bosom friendship is an exaggeration, but some chord was touched, emotionally, between the two men. Men who do not agree with one another can nonetheless harbour a quixotic liking or admiration: Churchill always admired a warrior, and Collins knew that, somehow, he had to learn the art of politics rather than fighting. The play is an imaginative reconstruction of how the encounter between the two might have progressed, drawing on historical sources. It is about Anglo-Relations relations at a crucial point in our history; it is about two very charismatic historical characters, republican and imperialist: and it is about something which must continue to be done in our world – when political negotiation has to arise out of conflict. The Edinburgh reviews were warmly favourable to the play and the performances. 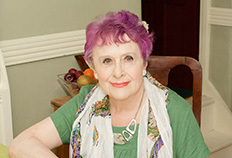 The Guardian critic Lyn Gardner wrote that “This play asks serious and interesting questions. Where is history really made? How are negotiations and treaties really thrashed out? How far do the personal lives of politicians affect the decisions they make and the deals they broker? Writer Mary Kenny goes at these questions hammer and tongs in a scenario that imagines what might have happened in a private meeting between the two men. Churchill, scion of the aristocracy, still believes in the Empire as ‘one of the great civilising missions of the world’. Collins, cast as a romantic hero by the British press, is lean, hungry and wolfish. These are men who inhabit not just different worlds but different universes, and the stage is set for a showdown between British imperialism and Irish nationalism. 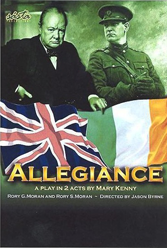 Allegiance was a lead review in all the main newspapers, and played to full houses. A transfer to the London stage was planned, but contractual problems arose in 2007-8. Yet Mel Smith has said recently that he hopes to bring it to London in the near future – he “adored” the play, he told an interviewer in the magazine Time Out (issue of 25 June-1 July 2009). The author especially appreciates a response sent by Mr Terry Corrigan, whose grandfather served with Michael Collins: “Sublime. Absolutely sublime. I read it in one sitting and then read it all over again. Never have I witnessed the transition of historic ghosts, to breathing, sweating mortals sculpted with such aplomb. I will read it again and again and will urge others to do the same.